Tom Fords and Nina Ricci’s may dominate our world of olfactory pleasures now, but if you walk down the stretch of Lower Chitpur Road you’ll get a throwback to a bygone era when attars ruled the world. Hit up these stores to stock up on these rare and natural scents that are drawn from flowers, plants and spices. One of the oldest attar stores in Chitpur, Haji Khuda Bukhsh was started in 1824 by a Lucknowi man who had come to settle in Kolkata. 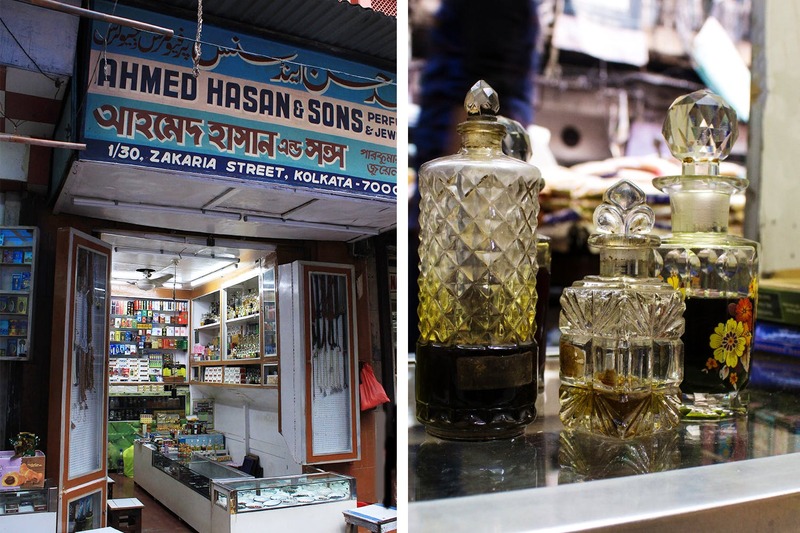 Now run by the eighth generation of the same family, it’s one of Kolkata’s most famous attar stores whose exceptionally fragrant attars are now available in the Biswa Bangla stores, under their brand ‘Chitpore’. They manufacture both edible and inedible attars, you’ll hardly find the imported variety at Haji Bukhsh. When in the store indulge in the scents of jasmine, hyati, shamama and oud. And remember to take some tips from brothers Neyaz and Shafiq on which fragrance to use for which season. Attars at this store start from INR 100 onward. Another old shop in the same neighbourhood that manufactures its natural fragrances is Asghar Ali and Mohammed Ali Perfumers. The moment you near the store you’ll be greeted with a brilliant whiff fragrant attars and rose water. While the old wooden cabinets, packed with vintage attar decanters and small vials, will take you back to the nawabi world, you’ll also notice workers huddling together and labelling bottles of rose and kewra water that they produce, besides the attar of course. Tucked just beside the main gate of the Nakhoda Masjid, this 45-years-old attar store sits under the jafri window of the mosque. While you may find some of the synthetic attars that come down from Mumbai in their shelves, the store stocks up mostly on Indian natural fragrances like musk, bel, gulab and rajnigandha. A small vial of natural attar (3ml to be precise) starts at INR 80 here, while you may find the synthetic ones for as cheap as INR 50. This one is less a store and more a stall, but has been around for more than 70 years now. Here at Md Ashraf’s store you’ll find a good mix of Indian and imported attars that come from the Arab countries. From chocolate musk to firdaus (a concoction of four flower smells)—the scents get as exotic as you can imagine. While the imported ones start at INR 120 at his shop, the Indian attars can be found for INR 50. When you enter Lower Chitpur Road from Burra Bazar’s end, the first attar shop that you’ll come across is Garib Nawaz Perfumery. The 15 year old tiny stall has different attars but this one is heavily stocked with the synthetic variety. Prices are as low as INR 40 here.